I love My Father’s World curriculum. Everything comes in one box and it’s pretty simple to organize. 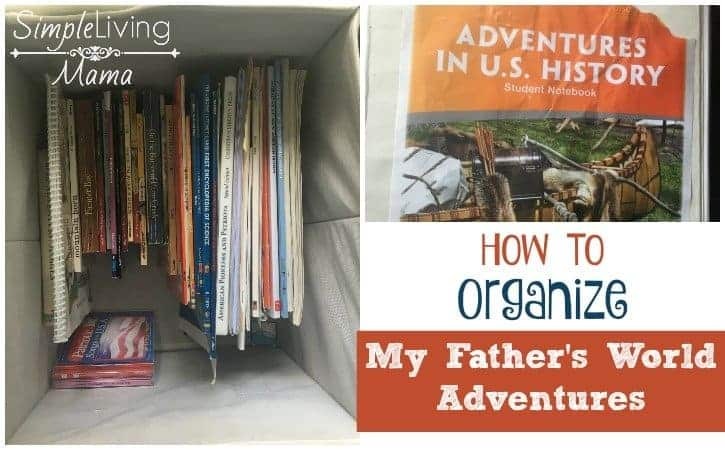 I know a lot of moms love seeing how other families have organized their curriculum, so today I am showing you how to organize My Father’s World Adventures! 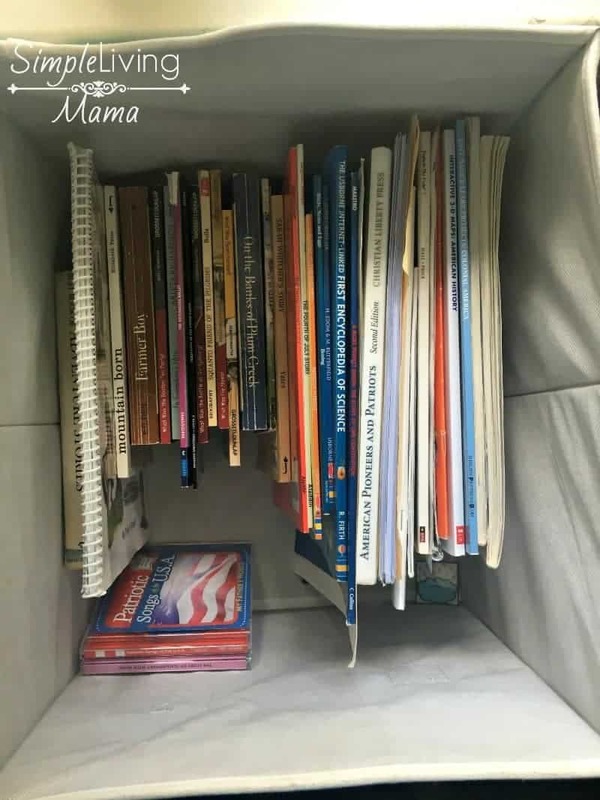 I have a curriculum bin where I store all of the books and student sheets for the entire curriculum. It’s really an incredibly easy method and it keeps everything together. All I have to do is pull out the books as we need them. The teacher’s manual tells me exactly what is needed each day, so this keeps things incredibly simple for me. 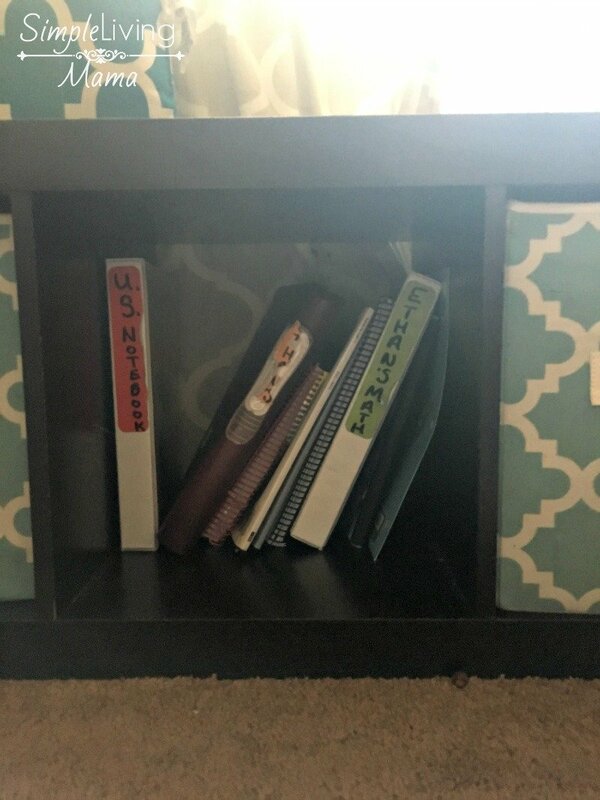 I store my son’s U.S. notebook, 2nd grade notebook, math notebook, and workbooks in his cubby. 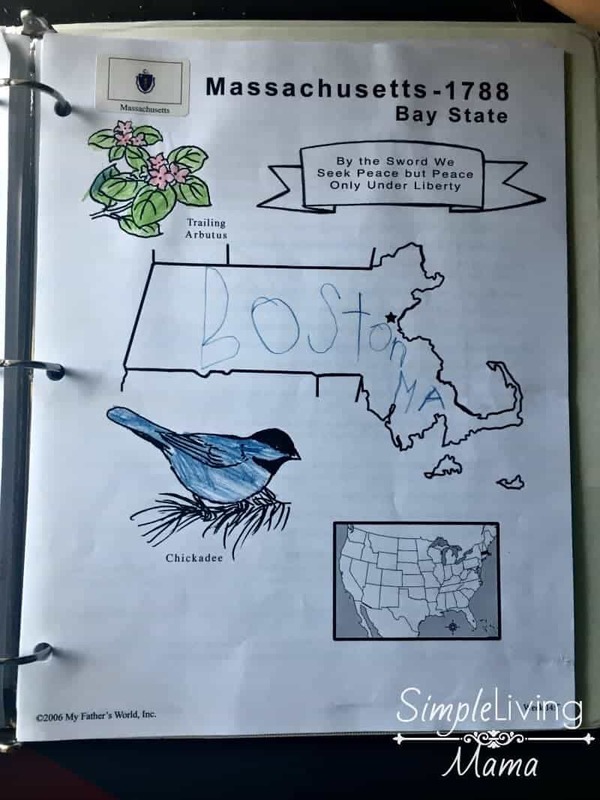 He knows exactly where they are at the start of each school day, and he puts them back when he is finished with his work.The notebooks act as a portfolio of his work. 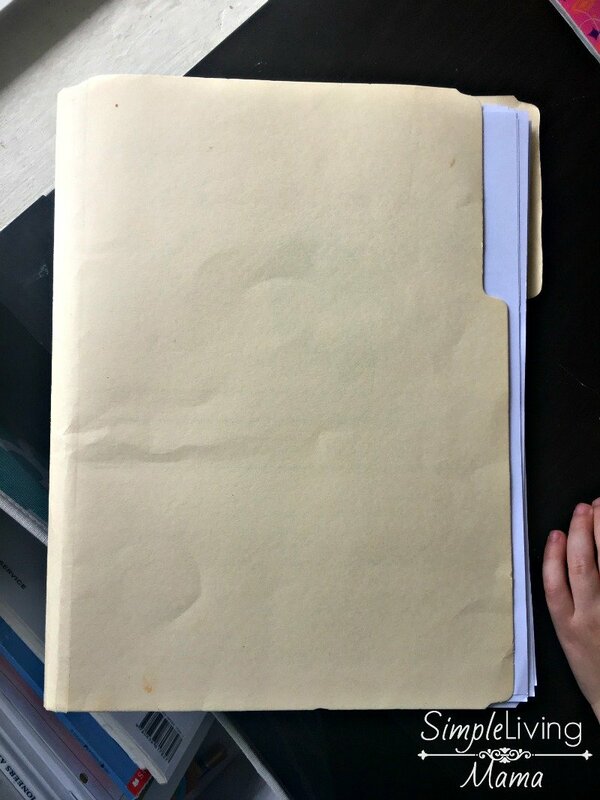 Student sheets are stored in a manila file folder in the curriculum bin. Since the curriculum sheets are in order when you get them, it doesn’t make sense to put them in separate file folders. Here’s a closer look at student sheets. Here’s the U.S. notebook. 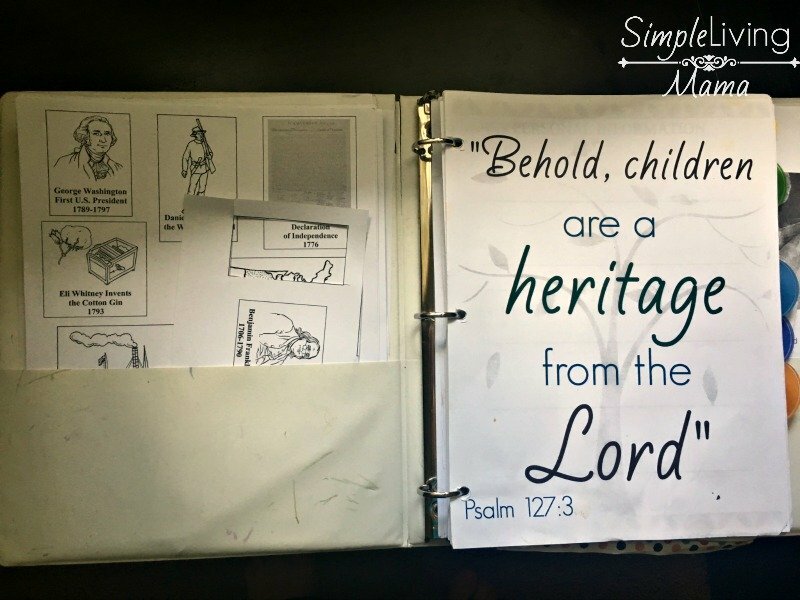 I use basic white 1 inch three ring binders. 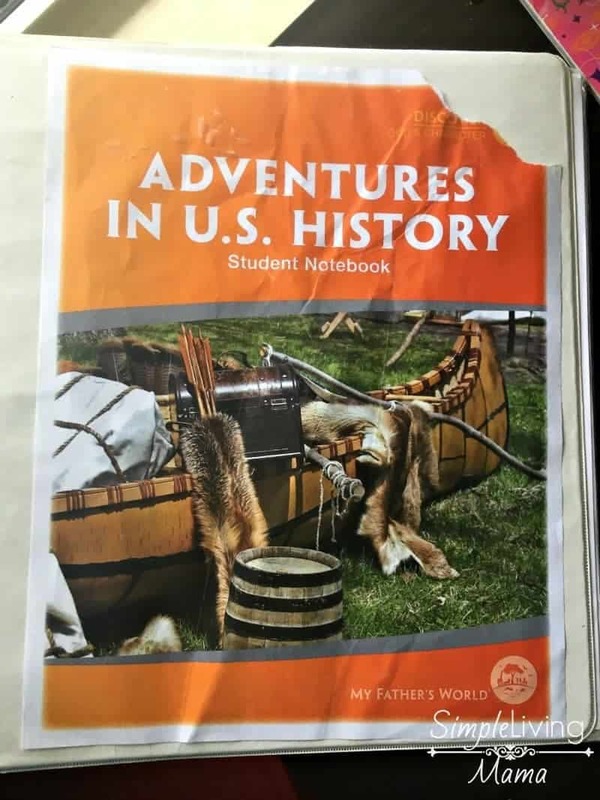 You can easily slip the cover from the student sheets into the front of the binder. 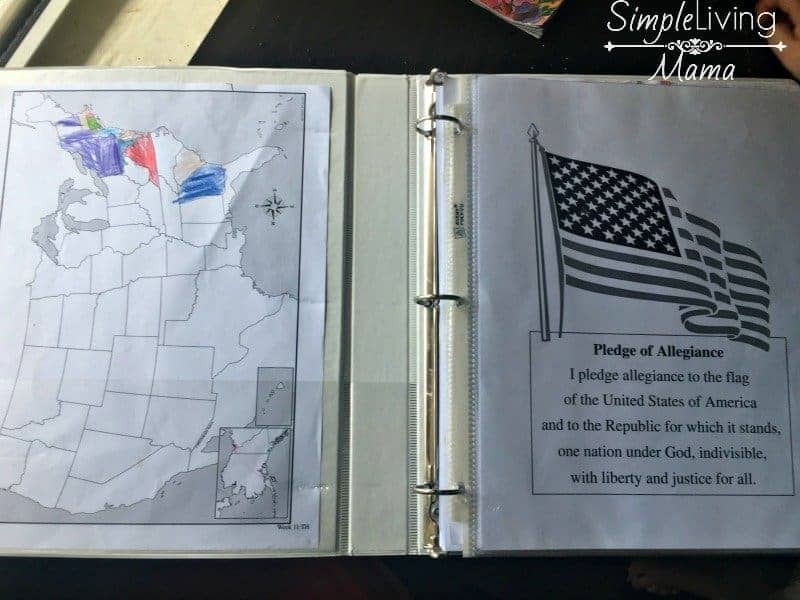 On one side of the U.S. notebook is our U.S. map, and then all of the other pages are in page protectors. 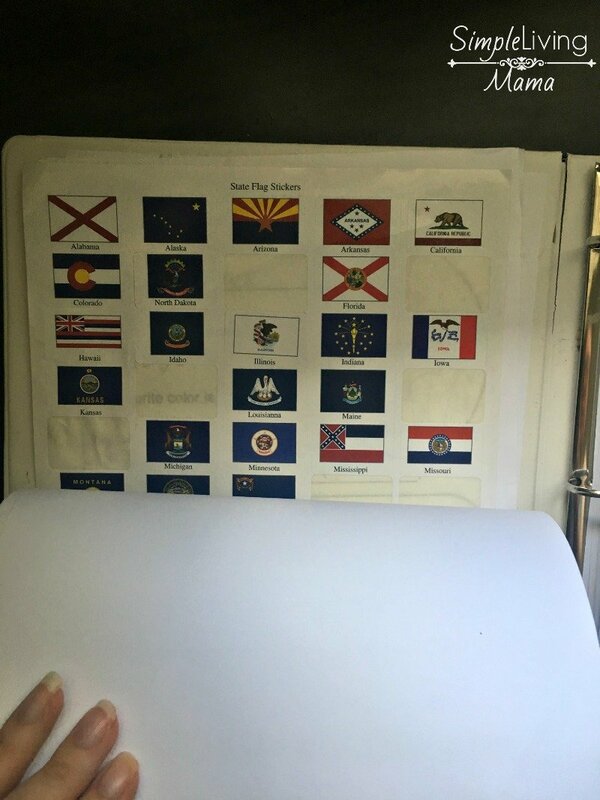 Some state sheets are just hole punched and placed in the binder. Here’s a look at one of his summary sheets. 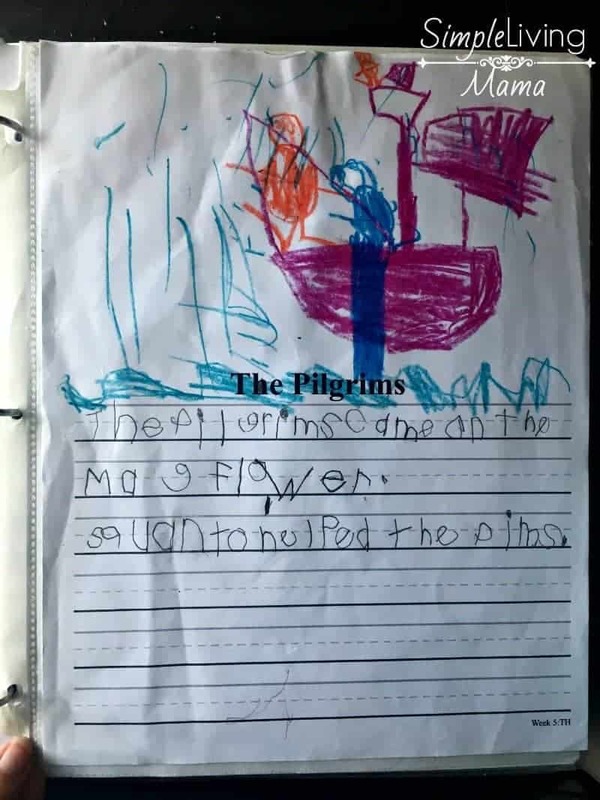 This one was during the week we learned about the pilgrims. 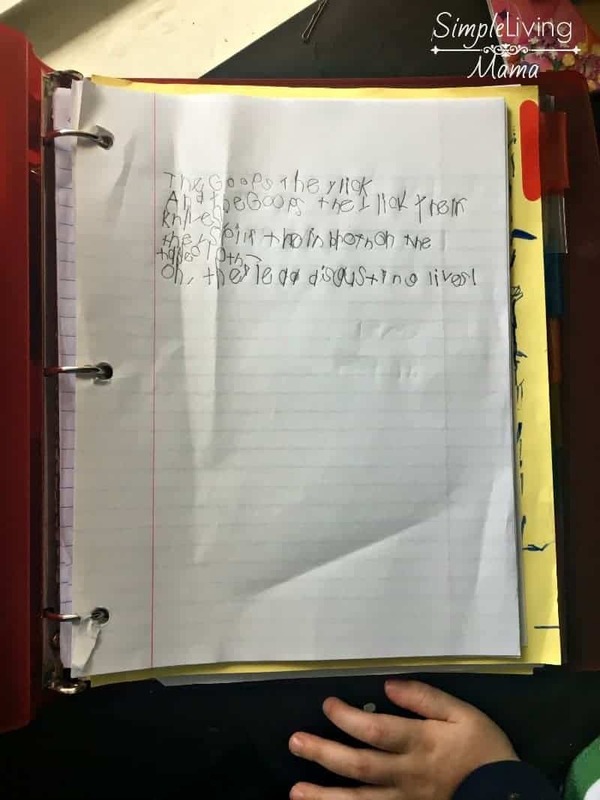 In his 2nd grade notebook I keep blank notebook paper at the front. Anything he is currently working on is there. The dividers aren’t labeled yet, but there is one for English, Spelling, Bible, Science, and Math. 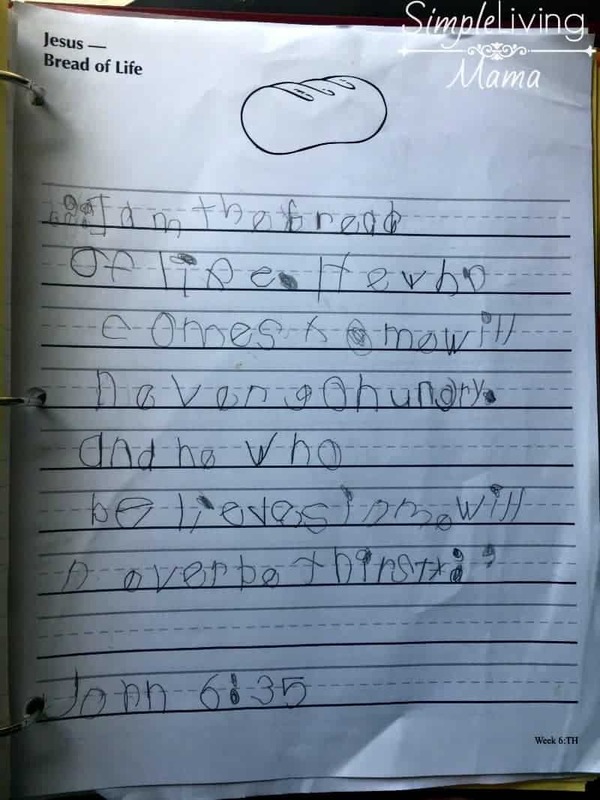 Here’s a look at a page of Bible copywork that is stored in the 2nd grade binder. 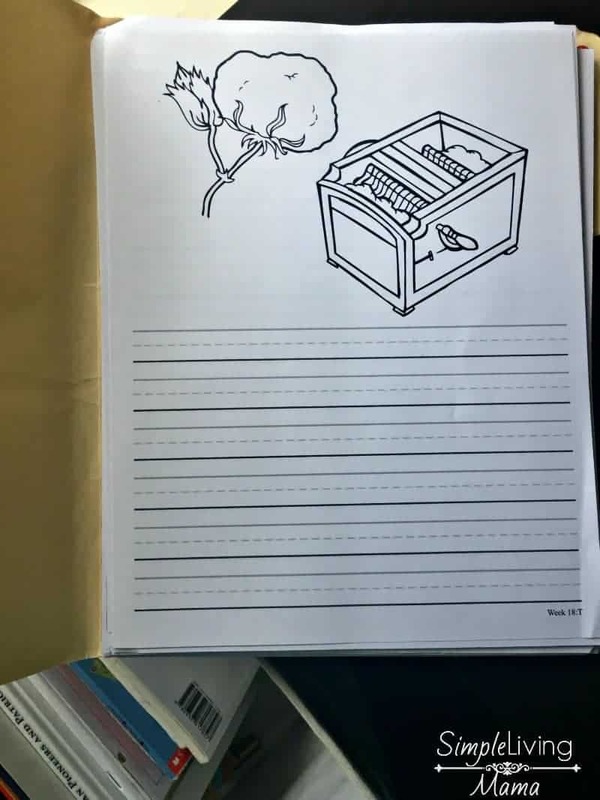 I keep everything else in my personal lesson planner. My lesson planner is made from a few different printable planners. 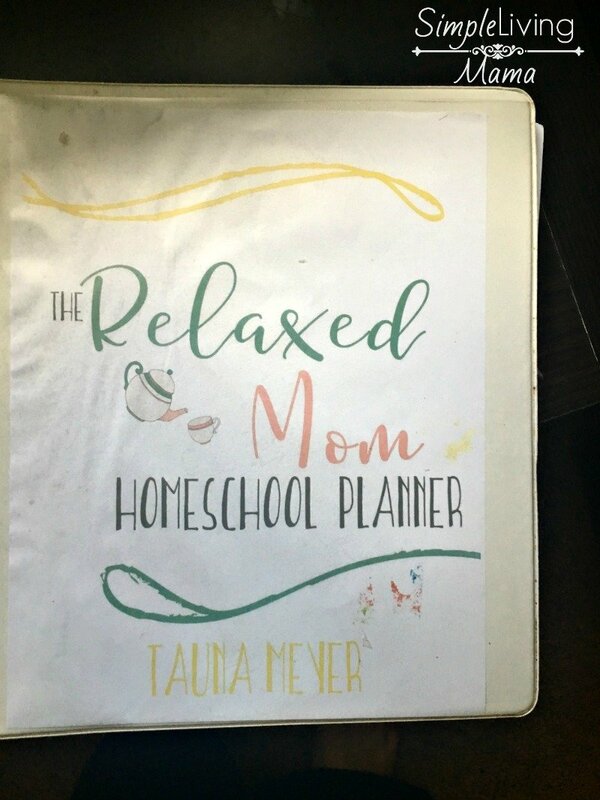 I have pages in here from the Relaxed Mom Homeschool Planner, the Homeschool Mom Life Binder, and my Homeschool Preschool Planner. In the front pocket I keep the timeline pieces and I currently have the state flower and bird flashcards there. They will be hole punched and placed on a jump ring. The first divider is available in my shop. The state flag stickers are also in the front pocket. And that is my super simple method for organizing My Father’s World Adventures. Everything is kept together where we can find it quickly. The main products I have used to organize this curriculum can be found down below at Amazon. Do you homeschool year around and take several breaks or do you take the summer off ,or a bit of both? I prefer to take summers off, but our school year has sort of gone according to my last few pregnancies. We take time off in the beginning when I’m really sick and then also a month or two around the time the baby is born. So this year we will finish Adventures at the end of July and then start ECC in October. My oldest will start Kindergarten. I had planned 6 weeks off in summer between pk and k. Here we are 4 wks in and he is ready to start again. We are keeping really simple and fun. I really appreciate your blog and vlogs, All your tips and reviews as well as just the example you have set are very helpful. Please keep doing what your doing (as time allows) I imagine it is a little difficult to find the time. Congrats on starting kindergarten! It’s a wonderful journey. Thank you so much for the kind words. I really appreciate them!